Read more about Michigan: 20,000 *more* would lose coverage post-ACA repeal than just a few weeks ago. Michigan: Rick Snyder channels Steve Martin from "The Jerk"
For the most part, Republican Michigan Governor Rick Snyder has taken a fairly hands-off approach when it comes to both the Affordable Care Act and Donald Trump. He pushed for both Medicaid expansion and a state-based ACA exchange, but while he managed to get the former through the GOP-controlled state legislature (albeit 3 months late and with a few conservative trimmings), he failed on the latter front, and pretty much shrugged it off after that. Since then, Michigan's implementation of ACA Medicaid expansion has quietly been pretty damned successful, with 646,000 Michiganders (strike that...it's now up to 666,000!) enrolled in the program...over 6.5% of the entire state's population. Beyond that, however, Snyder has been fairly quiet about the ACA overall to my knowledge. Read more about Michigan: Rick Snyder channels Steve Martin from "The Jerk"
The Republican Party could've Gotten Smart. Instead they're choosing KAOS. Thirty million people will lose their health insurance. Insurance premiums will skyrocket. Hospitals will lose billions. And if the Medicaid program is cut, state and local governments could raise taxes on hardworking families to make up the difference. We must work together to make healthcare better and more affordable for all. Our healthcare system is far from perfect, but repealing our healthcare without an immediate replacement plan that protects our care will put the health and financial security of millions of Americans at risk. Read more about The Republican Party could've Gotten Smart. Instead they're choosing KAOS. Read more about In which I (don't really) defend Donald Trump for not knowing how complicated healthcare can be. I guess the other 40% are being posted by me? A majority of online and social media defenders of Obamacare are professionals who are "paid to post," according to a digital expert. His shocking analysis was revealed on this weekend's Full Measure with Sharyl Attkisson, broadcast on Sinclair stations and streamed live Sunday at 9:30 a.m. Her upcoming show focuses on information wars and Brown was describing what happened when he had a problem with Obamacare and complained online. Brown said that social media is used to manipulate opinion, proven in the last presidential election. OK. First of all, "social media is used to manipulate opinion" isn't exactly a "shocking analysis". Read more about I guess the other 40% are being posted by me? Read more about "Tick Tock, Motherf*ckers!" Read more about UPDATED WITH DRAFT BILL: Introducing the Deplorable Care Act! The NeverEnding Story: CMS bumps out "grandmothered" plans ANOTHER year. Those in the first category were allowed to hold onto their existing policies for as long as they wished (or at least until they died or their carrier voluntarily chose to discontinue them). These policies were "grandfathered" in pretty much forever. Read more about The NeverEnding Story: CMS bumps out "grandmothered" plans ANOTHER year. 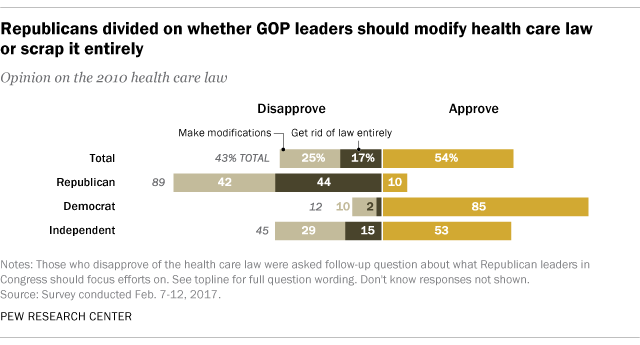 Read more about UPDATE: Pew: 79% now want to keep or "modify" ACA...only 17% want full repeal. Instead, he said changes to former President Barack Obama’s signature legislative achievement would likely be relatively modest. In the end, “Most of the framework of the Affordable Care Act … that’s going to be there,” he concluded. Let's hop in the Wayback Machine, Mr. Peabody! Over the past few weeks, a whole bunch of polls have come out showing that support for Obamacare has miraculously shot up substantially now that there's a very strong possibility that it will actually be repealed for real. Obviously there's a lot of "You don't know what you've got 'til it's gone" stuff going on here. For all the arguing and debate about the benefits and downsides of the ACA, however, there's one major positive which received some attention when it first passed but hasn't been talked about much of late: Rescission. Read more about Let's hop in the Wayback Machine, Mr. Peabody! This Is Why Republicans Win. So, All Around Awesome Dude @LOLGOP tweeted out a link to my "How many could lose coverage in YOUR Congressional District?" project, created as a resource for progressives, Democrats and others who support saving and improving the Affordable Care Act to use to provide quick, easy and reasonably accurate estimates to utilize for Congressional town hall meetings, social media and so forth. Read more about This Is Why Republicans Win. The Trump administration is deliberately sabotaging the ACA exchanges. The Trump administration is sort of trying to shore up the ACA exchanges. Congressional Republicans are full-speed ahead on repealing the ACA. Congressional Republicans are putting the brakes on repealing the ACA. The Individual Market isn't in a Death Sprial yet, but could be next year. The Individual Market is already in a Death Spiral in some states but doing just fine in others. A full replacement plan is ready to go at any moment. A full replacement plan hasn't even made it past the first stages yet. Read more about Schrödinger's Catastrophe. The Centers for Medicare & Medicaid Services (CMS) today issued a proposed rule for 2018, which proposes new reforms that are critical to stabilizing the individual and small group health insurance markets to help protect patients. This proposed rule would make changes to special enrollment periods, the annual open enrollment period, guaranteed availability, network adequacy rules, essential community providers, and actuarial value requirements; and announces upcoming changes to the qualified health plan certification timeline. Read more about My shortest blog post ever. On Tonight's Episode of As the Stomach Churns...Three ACA repeal-related stories hit the web practically on top of each other. Republicans in Congress are hitting roadblocks as they try to devise a plan to replace Obamacare, stuck over issues like how to structure tax breaks they want to give people to buy insurance. ...Republicans, who have spent more than six years vowing to smash the Affordable Care Act, swept into control of the White House and Congress pledging a swift repeal. But they’ve made little progress in deciding how to do that, or what should come next. ...Republicans agreed on vague concepts such as tax breaks, letting insurers sell across state lines and letting states run Medicaid. But then they hit a wall. Read more about The GOP is finally forced to return to the scene of the #RiskCorridorMassacre. Idaho GOP has the solution for 2.6 million people caught in the Medicaid Gap: Life Coaches! Read more about Idaho GOP has the solution for 2.6 million people caught in the Medicaid Gap: Life Coaches! The HHS Dept. of the United States has passed. Time of death: 2:11am. It's official: Tom Price is the nation's 23rd Secretary of Health and Human Services. Read more about The HHS Dept. of the United States has passed. Time of death: 2:11am. Over the past week or so, there've been several eyebrow-raising videos posted from Republican Congressional Town Hall meetings across the country. They show huge crowds of protesters demanding that the ACA be saved, ironically remnisicent of the Tea Party protests which showed up at Democratic Town Hall meetings just 7 years earlier. Read more about There's Something Happening Here. What It Is Ain't Exactly Clear. (near) Final OE4 Tally: 12.24M QHPs (13.0M with BHPs added). The table below is a slightly-modified version of the one I've been using for my "Trump Sabotage Effect" post. This version ignores all of that and simply presents all 50 states (+DC) together. A few days ago I assumed the grand total would come in between 12.3 - 12.4 million, but I was misreading California's total based on their previous report which had made it look like they would break 1.6 million. Instead, they came in 44K below that mark, so the national total now stands at exactly 12,227,442 QHP selections, or 3.6% below 2016's final total. There's only 2 states missing data now: Minnesota and Vermont. Read more about (near) Final OE4 Tally: 12.24M QHPs (13.0M with BHPs added). A record number of Idahoans signed up for health insurance coverage through the statebased health insurance exchange during the latest open enrollment period, which ended on January 31. In total, 105,977 Idahoans signed up for coverage through Your Health Idaho during the 2017 open enrollment period. For the past three years, Idaho has been the leader in per-capita enrollments for state-based exchanges. YHI is currently waiting on nationwide enrollment numbers to determine how it ranks for the 2017 open enrollment period. Trump killing HC.gov ads didn't impact state exchanges much...but OTHER Trump/GOP sabotage efforts sure did. Over the past few weeks I've compiled increasingly solid evidence (supported by a separate analysis by David Anderson of Balloon Juice) showing that yes, a significant portion of the reduced 2017 ACA exchange enrollment was due specifically to sabotage efforts on the part of Donald Trump and the GOP. I've mainly focused on the last-minute "ad kill" stunt pulled by the Trump administration, in which they yanked millions of dollars worth of TV ads reminding people fo the deadline during the critical last 5 days, and the evidence is pretty telling: Enrollment across the 39 states run through the federal exchange (HC.gov) dropped by about 5% from last year, while enrollment on the other 12 state exchanges increased by over 2% (there's still final enrollment data to be added from ID, MN, RI & VT). The reason this is so significant is that the state exchanges have their own marketing budgets, ad campaigns, outreach efforts and most significantly, branding. Ads promoting "Covered California" are gonna have a far bigger impact on enrollment for the residents of CA than ads for "HealthCare.Gov". There's some residual effect, because some people visit HC.gov first and are then redirected to CoveredCA from there, but for the most part, the state exchange branding is completely separate. (As an aside, this can sometimes have negative consequences, as in the case of "kynect" in Kentucky, which did such a bang-up job of isolating their brand from "Obamacare" that most of the state hasn't the foggiest idea that the two were the exact same law, but that's a separate discussion). Read more about Trump killing HC.gov ads didn't impact state exchanges much...but OTHER Trump/GOP sabotage efforts sure did. Read more about UPDATE: I Watched the Sanders/Cruz Obamacare Debate So You Don't Have To. I've been cautioned that these numbers are preliminary, but that's true of all of the "final" enrollment numbers to date; there are often minor clerical corrections and the like before the final numbers are baked in. Anyway, here's the OE4 QHP enrollment numbers for the DC exchange, which is up about 3.1% over last year. However, according to the official ASPE report for 2016 Open Enrollment, DC's QHP tally was slightly lower (22,693); since that's the official total used by HHS, that's what I'm going with, which means they've enrolled about 4.1% more this year. New plan selections met enrollment projections for the fourth open-enrollment period. Nearly 50,000 consumers signed up for health care coverage in the final two days before the Jan. 31 deadline. Strong finish and overall enrollment are credited to effective work by Certified Insurance Agents and enrollers and robust television, digital, print and outdoor advertising that ran throughout the open-enrollment period. The crucial demographic of young adults ages 18–34 accounted for 37 percent of enrollment, contributing to a healthy risk mix for 2017. SACRAMENTO, Calif. — Covered California announced Monday that it finished the open-enrollment period with 412,105 new consumers signing up for health coverage. Today marks the end of our fourth and by far most successful Open Enrollment period. The number of plan selections ran 12% ahead of last year’s pace and the volume of last-minute customers Monday and Tuesday led us to extend sign-ups for three days for those who started the process before Tuesday’s deadline. I share this information with extreme gratitude to our dedicated staff, our Assistance Network, our Broker partners, our health insurance company partners and the many other supportive stakeholders who helped us move forward with our shared mission no matter the headwinds we encountered along the way. There's no specific number listed, but last year's official Open Enrollment Period QHP selection total for Colorado was 150,759 people. Grab 'em by the Pi: In which the Trump administration channels the 1897 Indiana state legislature. Any high school geometry student worth his or her protractor knows that pi is an irrational number, but if you’ve got to approximate the famed ratio, 3.14 will work in a pinch. That wasn’t so much the case in late-19th-century Indiana, though. That’s when the state’s legislators tried to pass a bill that legally defined the value of pi as 3.2. The very notion of legislatively changing a mathematical constant sounds so crazy that it just has to be an urban legend, right? Nope. As unbelievable as it sounds, a bill that would have effectively redefined pi as 3.2 came up before the Indiana legislature in 1897. Read more about Grab 'em by the Pi: In which the Trump administration channels the 1897 Indiana state legislature. Read more about UPDATE: Did Trump actually robocall people urging them not to enroll last week? Congrats, Trumpublicans: Your ACA sabotage efforts "worked" beautifully: HCgov peters out at 9.2 million. Before the election, I was assuming the 2017 Open Enrollment Period would rack up between 13.5 - 14.0 million QHP selections...between 6% - 10% more than last year. The HHS Dept. agreed with me, projecting around 13.8 million (an 8.6% increase). After Trump won and the GOP immediately started the actual legislative process to repeal the Affordable Care Act with preliminary votes in both the House and Senate, I downgraded my projections to around 13.3 million nationally (10.2 million via HC.gov). Read more about Congrats, Trumpublicans: Your ACA sabotage efforts "worked" beautifully: HCgov peters out at 9.2 million. Read more about Hold Everything: Trump/GOP suddenly reverse course, scramble to "repair" and "stabilize" ACA after all? Or is it another big head fake? Read more about TIMELINE: Obamacare stabilizes just in time for TrumpCare/GOP to destroy the market. I've stated many times over the past few weeks that between the GOP actively starting the legislative repeal process with preliminary votes, Trump actually taking office, his executive order within hours of doing so instructing the HHS Dept. to actively sabotage implementation of the ACA, and the last-minute yanking of TV advertising for the final few days of Open Enrollment that there's simply no way of making a solid prediction about what the final enrollment tally will end up being. However, based on previous yearly patterns and spot-checks of HealthCare.Gov and the buzz from some of the state exchanges earlier today, I'm still gonna take a shot: I expect the final QHP selection tally to come in...pretty damned close to last year's 12.7 million, actually. Officially, I'm giving it a range of anywhere between 12.4 - 13.0 million, with around 9.5 - 10.0 million of that coming via the federal exchange (which covers 39 states this year, including Kentucky) and the remaining 3 million or so being courtesy of the 12 remaining state-based exchanges.